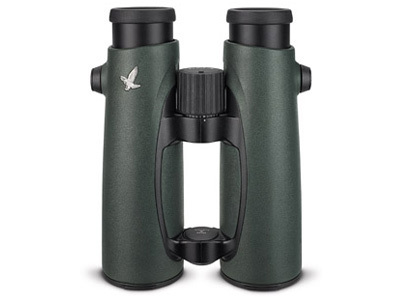 The view is astounding and the handling is superb - glassing through the EL 10x50 SwaroVision Binocular from Swarovski brings the cutting edge of optical performance to a new level. While the original EL series set the benchmark for clarity, colour accuracy, and handling comfort, the EL SwaroVision binoculars raise the performance bar even higher. Keeping pace with the optical train, the EL SV's construction also benefits from some advanced fine-tuning. The EL's open-bridge design provides viewers with long-term viewing comfort, enhanced stability, and ease of handling. The housing is covered with a rubberised finish that offers a secure tactile grip and a bit of shock resistance. Stellar all-climate performance is ensured via nitrogen purging. The rugged magnesium housing is sealed and purged to create a watertight and fogproof internal system - one that's impervious to dynamic climates and difficult conditions. A wide angle field of view and truly noteworthy eye relief contribute to this fine sporting optic's viewing performance. Even when wearing glasses, the view remains unobstructed, free from vignetting, and lush with crisp detail.